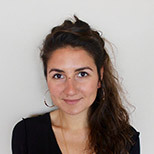 Alessandra Bergamin is a freelance journalist based in Los Angeles. Her work focuses on immigration, agricultural communities, public health and environmental justice. She is an alum of UC Berkeley’s Graduate School of Journalism.